← Brand new Christina Image hits the web! With Sony Music the only official music supplier for the 2010 FIFA World Cup, there are a few exciting music projects in the pipeline. We are proud to bring you the first look at one of the official compilations hitting shelves on the 31st May 2010. 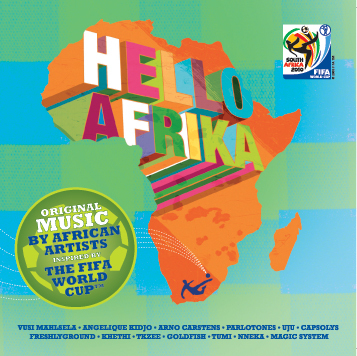 Hello Afrika – Popular hit tracks by contemporary superstar African artists from all over the continent inspired by the 2010 FIFA World Cup – a World Cup but with Africa as the theatre and South Africa the stage! Fantastic line up don’t you think? we wanna hear your thoughts? This entry was posted in First Look, Global Artists, Local Artists, World Cup 2010 and tagged 2 Face, Africa, Anjelique Kidjo, army white, Arno Carstens, artists, Aya, Baaba Maal, brothers of peace, Danyel Waro, Deep Level, FIFA 2010 World Cup, freshlyground, gavin hardkiss, goldfish, HHP, Hugh Masekela, Jason Hartman, Jozi, Just Jinjer, kelly rowland, Kesha, kheti, Lorraine Claasen, Louise Carve, magic system, malaika, MI, Moh Dediouf, Music, Nameless, Nneka, Ntando, Oliver Mtukudzi, Parlotones, Samini, Siphokazi, South Africa, Soweto Gospel Choir, Teargas, Ternielle Neilson, tkzee, tumi, UJU, Vusi Mahlasela, Yvonne Chaka Chaka, zubz, zuluboy. Bookmark the permalink. Awesome line up! Its going to be a killer compilation. where is blk jks on the list? Ooooohhh! I love world music. I’ve heard a couple of the songs and I am impressed. Can’t wait to own a copy-whether from purchasing one or preferably winnng one. 😉 It’s gonna be lekker! Great idea. oh just great! i cant wait to get the album! when is it coming out?? Judith Sephuma Collaborates with Michael Bolton, in Studio, and on Stage!